I know you've all heard about Starbucks' Unicorn Frappuccino. 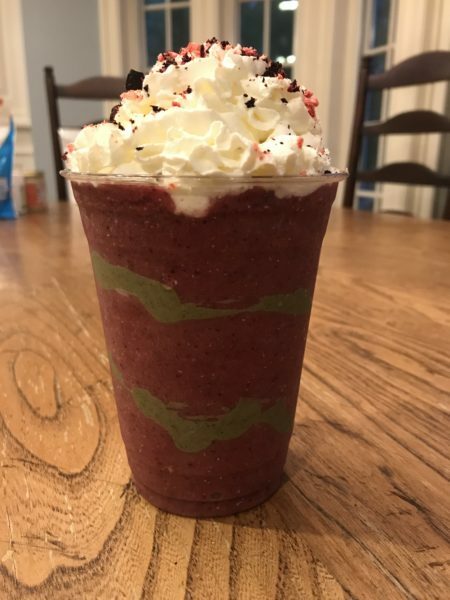 That limited time, colorful, sparkly, sweet-and-tart calorie bomb the coffee shop enjoyed so much social media attention about. In fact, such attention dribbled down to my own children (well, some of them) and they started asking about it the first day it was released. (The Unicorn Frappuccino is officially gone from Starbucks as of sunday) Well, we didn't get to Starbucks until friday, and by then they were sold out. I knew something was up when I saw throngs of middle-school aged girls and older people with excellently groomed eyebrows just standing around glumly, eyeing their pink-but-not-Instagram-worthy drinks with thinly masked disgust. Not one to be discouraged, my oldest daughter found a copycat recipe in the time between ordering from the now-surly unicorn-depleted barista and the receipt of consolatory warmed scones. And when I checked my email later that day, there was a recipe from my girl the Detoxinista for a healthier version of the Unicorn drink using spirulina powder and dragon fruit. My daughter's suggestion was from PopSugar and featured Kool-aid powder and grenadine. A taste-off was in order. Spirulina turned out to be hard to find. I didn't really know what it was, but by the time I realized it's algae and is used mostly as a dietary supplement, I was at Stop and Shop. They do have a lot of vitamins and such, but the only spirulina I found came in a green powder. I'm no Gwenyth Paltrow, but I did spend almost 30 bucks on this one ingredient. But you don't have to. I found a smallish container of [amazon_link id="B00DBCAV7Q" target="_blank" ]spirulina tablets[/amazon_link] you could probably crush into powder from Amazon for $7.99. I also ran into trouble with the Dragon Fruit, which the Detoxinista blithely states can be bought at Whole Foods. Well, there was no Dragon Fruit/Pitaya puree at the Whole Foods when I went there, perhaps because they seem to have just reorganized all of the frozen fruit and berries. So, I got some frozen pomegranate and figured I could get to the magenta color Dragon Fruit has with that and some blueberries. For the topping, I used rice whipped cream so the whole thing could be vegan. I also put freeze dried and crumbled blueberries and strawberries. This version features grenadine syrup and mango syrup, which I was unable to find at the either grocery store in town. Later it occurred to me that maybe Gary's Wine would have had at least the grenadine. In any case, I discovered we could make those pretty simply, (here's the mango syrup recipe and the grenadine syrup recipe) so we did that. It also calls for citric acid, which I also couldn't find. I later read that it is maybe with canning supplies or kosher foods and labeled sour salt. I just skipped it altogether. What I did wind up getting were two packets of kool aid powder (sour raspberry in blue and pink lemonade, two packets of rock candy (one pink, one blue), vanilla ice cream, white chocolate chips, and whipped cream. I let my daughter do most of the cooking. For a time it got turnt in my kitchen. Loud, female empowerment-lite pop music was on, we danced around, pouring cups of sugar and bright pink powders in the blender. It was fun. The healthy option got a "wow, that's not the worst," reaction. And because the ingredients weren't so bad, I put the leftovers in an ice cube tray and blended them up in the morning with some almond milk for a breakfast smoothie. (I tried sneaking some spinach in there and it turned green! But with a few more blueberries it looked purple and palatable again.) The one thing I wouldn't do is use rice whip again. The brand we used was not tasty, although it made a clean presentation. Detoxinista uses a coconut milk whip that would probably taste better. As far as taste goes, I don't think we missed out on anything, and it was not worth chasing down the ingredients (and spending all that money). But the time giggling in the kitchen was well worth it!